"Hollywood celebs: We will go on ‘total strike’ if Trump does not resign." By Amy Sherman on Tuesday, January 9th, 2018 at 6:00 a.m. Fake news reports said without evidence that celebrities threatened to go on strike unless President Donald Trump quit. "Hollywood celebs: We will go on ‘total strike’ if Trump does not resign," said a Dec. 30 headline on Nourtey.com, a fake news website that attacks Democrats. 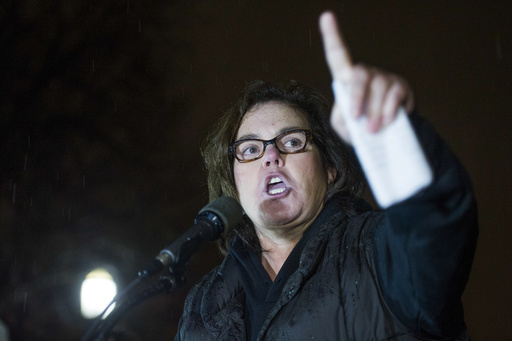 The story suggested Rosie O’Donnell was among the celebrities threatening to go on strike. Facebook users flagged the Nourtey.com post as being potentially fabricated, as part of the social network’s efforts to combat fake news. This story mimics earlier reports that have circulated for at least a year. Shortly before Trump’s inauguration, a similar story surfaced on therightists.com that said celebrities were calling for a strike within the movie industry in hopes that it would urge Trump to resign. Snopes found that the rumor stemmed from an ad in the New York Times by the group Refuse Fascism. The group, which included O’Donnell, called for millions to hold a protest to "create a political crisis that prevents the Trump/Pence fascist regime from consolidating its hold on the governance of society." Thousands of people, including musicians, actors, professors and authors, signed the petition as of Jan. 6, 2017. The celebrities were not calling for a strike barring Trump’s resignation. O'Donnell told NBC Late Night host Seth Meyers in November 2017 that she has been in a "severe depression" since Trump won the presidency and that she spends "90 percent of my waking hours tweeting hatred towards" Trump. The pair have bad blood going back to O’Donnell’s time on ABC’s The View, when she criticized Trump on multiple personal and professional fronts after his decision not to fire a Miss USA accused of drug use and other wrongdoing. We messaged O’Donnell on Facebook to ask if she had threatened to strike and received an automated message: "Please use my memes and articles as a resource to fight against Trump. I read all of my messages. #LoveTrumpsHate #ResistTrump Please don't leave hateful comments or memes on my page. Stay Rosie." So Nourtey.com said, "Hollywood celebs: We will go on ‘total strike’ if Trump does not resign." While O’Donnell was among the celebrities who signed a Refuse Fascism petition calling for protests leading up to Trump’s inauguration and has continued to criticize Trump, we found no evidence that there was a plan for a mass strike among celebrities. We rate this headline False. Published: Tuesday, January 9th, 2018 at 6:00 a.m.